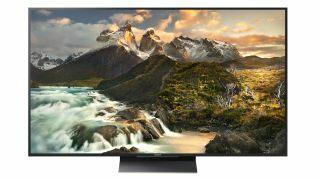 Sony has taken the wraps off a new 4K HDR (High Dynamic Range) TV range, the Z Series – and it's amazing. Just when we all thought we could sort our HDR apples from SDR pears, the company has kicked-over the apple cart. TechRadar had a chance to get up-close and personal with the new ZD9 range, at its European unveil at Sony Pictures HQ in London, and took a closer look behind the screen (literally) at the radical Master Backlight Drive technology which makes them so special. The Sony ZD9 will land in 65-, 75- and 100-inch guises later this year, most likely just after the IFA 2016 tech show, which runs September 2 – 7. The KD-65ZD9, KD-75ZD9 and KD-100ZD are priced at £4,000 ($6999, around AU$7048), £7000 ($9999, around AU$12,335) and £60,000 (around $79,148, AU$105,728), respectively. Sony first teased its Backlight Master Drive wizardry at CES 2016. Unlike conventional edge-lit LED backlights, and to a certain extent Full Array Local Dimming (FALD), the Master Backlight Drive employs controllable LEDs, able to glow at peak intensity with astonishing precision. The onscreen effect looks much more like what you would expect to see on a self illuminating OLED than on an LED LCD TV. Only a heck of a lot brighter. When shown in prototype form at CES, Sony claimed a peak brightness of 4000 nits, with 1000 zones of control. But with this commercial roll-out the company is keeping numbers close to its chest. "We are not announcing the actual brightness or how many zones of backlighting control we use," confirmed Sony Europe's TV GM Motoi Kawamura. Not even a clue? "No. That is our policy." When pushed repeatedly, Motoi conceded the peak nit output was "more than 1000 nits." However, this won't change Sony's stance on the UHD Alliance and its Ultra HD Premium certification. "We are not announcing the actual brightness or how many zones of backlighting control we use"
"We will not be submitting the ZD9," he said blithely. It probably makes good sense for Sony to keep specifics under wraps. It encourages speculation that the Z Series screens are capable of 4000 nits, like the prototype, which is no bad number to bandy about. And if the reality is these models offer considerably less, Sony still benefits from the speculation. Of course, all that really matters is what the ZD9's pictures look like. And in that regard, the screen is a bit of a jaw-dropper. While Sony dodges the numbers game, its boffins did allow us to take a closer look at the Master Backlight Drive itself – although no photographs were allowed. The backlight panel comprises a diffusion sheet and a bank of controllable LED lights. Imagine the bulb arrangement on an LED torch, extrapolated hundreds of times. This white LED array is driven by a precise lighting algorithm, with each calibrated beam under individual control. Unlike old school backlighting, which inevitably leads to halos around bright objects on a bright background, here the discrete LED control seems able to dim and boost each LED individually. Bright images look crisp on a black backdrop, and while we obviously reserve judgement until samples can be properly tested, the results seemed stunningly sharp and dynamic. This is like OLED on steroids. There's more to the ZD9 than fancy lights, though. The Z series also introduces a new image processor, the X1 Extreme, said to be 40% more powerful than the X1 processor used elsewhere on the Sony line. This uprated silicon introduces object-based HDR remastering, dual database processing, and a 4K HDR iteration of Super Bit Mapping. Object-based HDR remastering looks particularly impressive: It takes SDR footage and gives it an HDR style makeover, using scene-by-scene analysis. We were shown a variety of SDR footage, upscaled to near HDR. From an old lady weaving in the sun, to buildings and sushi. All looked to benefit from the process. White linen seemed cleaner, while white plaster rendering looked more dynamic. The fish seemed fresher. The X-1 Extreme processor also improves noise reduction, by searching through thousands of picture patterns in an on-chip database, and deleting what it thinks is errant noise. Similarly clever, the new 4K version of Super Bit mapping employs 14-bit signal processing, creating 64 times more colour gradation for smoother transitions. To demonstrate just how effective all this processing is, Sony staged comparisons with a rival LG OLED and Samsung 4K TV. With X-Tended Dynamic Range Pro switched on, it beat out both in terms of peak brightness and fine detail (pinch of salt obviously taken). Some HDR demo footage of surfers really gave the Z series an opportunity to shine. The sun, caught in a frame, looked smaller and more controlled on the ZD9 than it did on the LG and Samsung screens, demonstrating the precision of the backlight illumination. Both rivals showed the same shot with a larger, more diffuse sun. Water spray in the same frame looked highly detailed, more so than on its rivals. Yet despite these highlights, the ZD9 maintained a deep convincing black level. All the TVs were shown on Vivid mode. Using the movie version of the Angry Birds movie to emphasise colour performance, it became clear that when X-Tended Dymaic Range pro was turned off, the screen looked far more comparable to its rivals. The colour gamut looked extraordinary. The panels are no slouch when it comes to design either. Sony has gone for a slate black bezel, trimmed with subtle gold. Set designer Hiroaki Yokota explained that the rear panel has an unusual grid pattern because it completely disguises the pop-off input covers. With the ZD9, Sony has delivered a screen that really seems at home with HDR content. It combines the deep black levels and bright border precision of a self emissive display the out and out retina-blasting brightness of a high-performance LED. Has Sony really found the sweet spot for HDR? Is the ZD9 really an OLED killer? We'll doubtless know more in a few months, but for now colour us very excited.